While opening the foldable part of the box, your loved one will discover one by one your photos hidden inside, adding so many special memories leading to the gift itself. And since the box is magnetic, you can hang it on your fridge once it is laid out flat. Convinced you just found the perfect gift? Let’s get started! Your surprise foldable box, along with the inner wooden box, will come with your own selection of 13 photos and pictures. They will be printed on a high-quality photo paper at just the right size for your box, ready to be placed as you’ll like. It’s an easy 5-minute job. Purchase a token set together with a box to have a gift ready to be given! I crafted the first LovinBox for the love of my life, a few years ago. From there, there has been no looking back. I hope your LovinBox will have as much success as my first one. absolutely love this! its perfect and the pictures are perfect and great quality!!! Can I place my photos as I wish inside my box? Absolutely, the purpose is to make your own creation. I provide everything you need to place them as you like, it's an easy 5 minutes job. How many photos/pictures can I send and how can I send them? The online editor tool will let you import photos from your device or from your favorite social media. You will also find a library where you can pick filler images like the ones visible on the examples and a text feature letting you personalize your pictures with quotes and sayings. And if you need anything, do not hesitate to send me a message on Etsy. Is it possible to create and print custom quotes, saying and messages? While using our online editing tool (https://image-editor.lovinbox.fr/), you can easily add texts on your pictures. You'll also find a library where you can select different backgrounds to write customs quotes and saying on. But if you think you'd still need help with this process, simply send me a message on Etsy and I'd be glad to assist you. 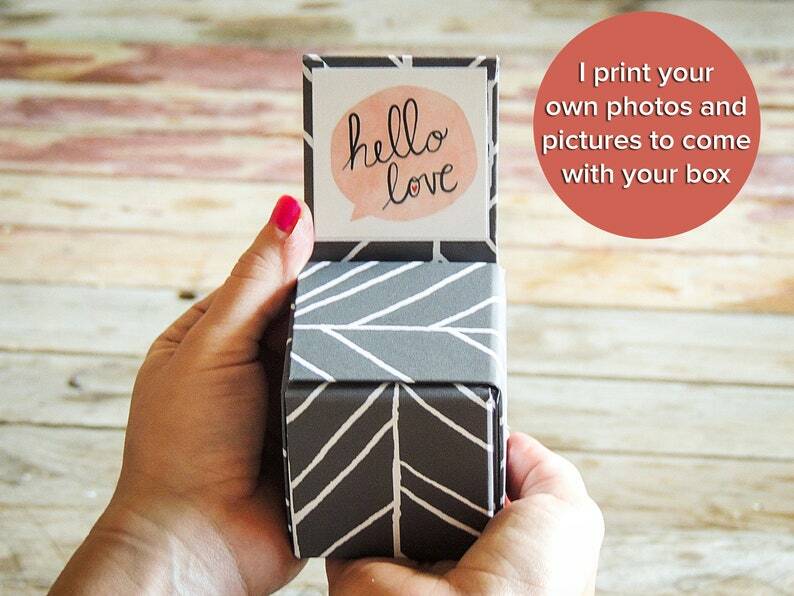 Once I’ll receive your pictures, I'll need up to 3 days to craft your box and print your photos. Then your package will be shipped using the USPS service you'll have select when checking out. You can leave a phone number in the buyer note when checking out to make the delivery even easier! I’d need the box to be ready to be open by the person who will receive it. Could you place the photos inside the box for me? Of course! If you will not be able to physically give the box yourself, I can prepare everything for you and ship it ready to be open. You can simply leave your instruction in the buyer note when checking out.